First Tactical's Hard Knuckle glove is designed to be both reliable and durable, without giving up the mobility of lighter wear alternatives. The TPR knuckle design is isolated and hidden, allowing independent knuckle splay and rotation and providing amazing tactility while maintaining solid, reliable protection. Reinforced neoprene padding and TouchPoint fingertip design come together to give you a complete and functional tactical glove. These gloves are made with a machine washable goatskin palm and midweight, snagproof stretch woven material that offers precise, professional fit and appearance. 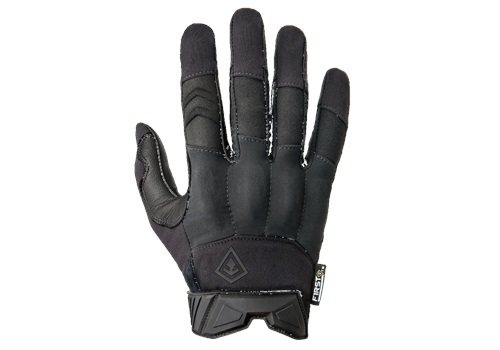 At this time, the gloves are only available in men's sizes and in Black. They retail for $39.99. Headquartered in Modesto, CA, First Tactical makes functional gear created for professionals. Guided by the principles of innovation and reliability, First Tactical works firsthand with law enforcement, firefighters, and emergency medical personnel to create durable products that meet the needs of public safety. By working directly with real-world users and utilizing expertise of high-quality professionals, all of First Tactical's products are put through demanding conditions to ensure they can reliably perform. Learn more about First Tactical's clothing, Advanced Women's Fit, outerwear, accessories, and what's to come at www.FirstTactical.com.